The pair grew close while filming sitcom 'Cheers' and Kirstie admits she developed strong feelings for the actor. The actress had to remind herself she was married to stop the temptation to embark on a passionate affair with Woody. Writing in her memoir, 'The Art of Men', she revealed: "He would incessantly insist we sleep together, half joking and half serious. 'We're not sleeping together', I would say, half wishing I wasn't married so we could." 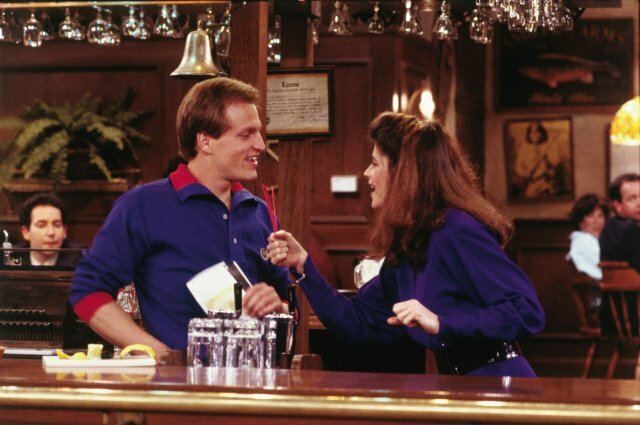 When Kirstie played bar manager Rebecca Howe in 'Cheers' she was married to her second husband, actor Parker Stevenson. The couple - who have two adopted children together, William True and Lillie Price - eventually divorced in 1997. Woody was not married when he portrayed naive barman Woody Boyd in the bar based comedy series from 1985 to 1993. Last week, Kirstie admitted John Travolta had been the love of her life. The 61-year-old actress fell for the actor on the set of their film 'Look Who's Talking', which was shot almost 25 years ago, but she couldn't act on her feelings because she was married to Parker at the time. Kirstie said: "Believe me, it took everything that I had, inside, outside, whatever, to not run off and marry John. And be with John for the rest of my life. [He was the] greatest love of my life." Kirstie's book 'The Art of Men' lifts the lid on the behaviour of all the guys she has dated and the famous men she has worked with.